After retiring from 21 years of service with the United States Navy, Jennifer Foxworthy set out to pursue her passion of delivering speeches designed to inspire, motivate and encourage others. 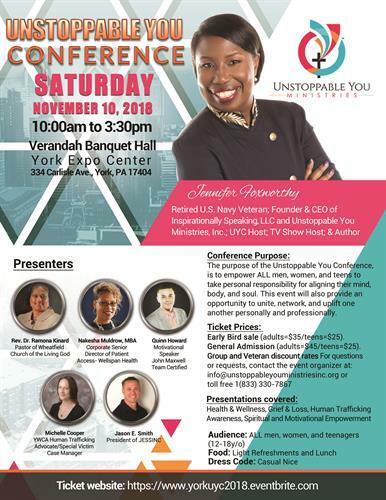 The Unstoppable You Conference aims to empower ALL men, women, and teenagers to take personal responsibility in aligning their mind, body, and soul. This event will also provide an opportunity to unite, network and uplift one another other personally and professionally. Other speakers at the conference include Rev. Dr. Ramona Kinard, Pastor of Wheatfield Church of the Living God; Quinn Howard, Motivational Speaker and John Maxwell Team Certified; Nakesha Muldrow, MBA, Corporate Senior Director of Patient Access- Wellspan Health; Michelle Cooper, YWCA Human Trafficking Advocate/Special Victim Case Manager; Jason E. Smith; President of JESSINC. The event will also feature a head to toe fashion makeover for selected men and women utilizing homeless shelters. Last but not least, there will be several independent vendors representing various industries. Doors open at 9am for meet and greet and pre-vendor showcase. Early Bird online tickets are $35.00 (adult) and $25 (teenagers). General Admission online or at the door tickets are $45.00 (adult) $25.00 (teenager). Veteran tickets are $35.00 and will be available at the door with proof of service. Group tickets are available when purchased in advanced through event organizer.